Your "Glad Recipient" will think you're a "Thoughtful Gift Giver" with one of these versatile gift certificates. What precisely do you get your great aunt Edna, you know, the one who your only interaction with is an occasional squeeze on the cheek? What about your co-worker Bobby who you know nothing about except that you picked his name for the work secret Santa? What about your dentist? Or your really good friend who you know is an avid reader but forget exactly what she is an avid reader of? 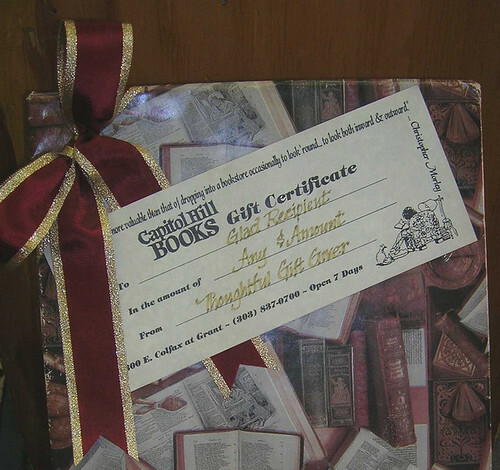 And since we have books on almost every subject, you can be sure that a Capitol Hill Books gift certificate would be appreciated by everyone from your uncle Larry to your aunt Louise. This entry was posted in Uncategorized and tagged books, gift certificates, gifts, holiday. Bookmark the permalink. ← Buy local. Support your community.